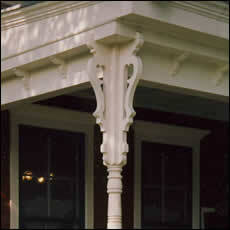 As their name implies, Post Face Brackets are typically installed on the flat, outward "face" at the top of Porch Posts. Tall relative to their width, they are normally used in 1-1/2" thickness and unframed. We can customized the length of many of our Post Face Brackets. We do this by adjusting the straight portion above the "foot". This can be a desirable change, as the bottom of your Post Face Brackets should end at approximately the same point as your regular Post Brackets for the best overall effect. Please inquire. Additional and cost effective customization is available for the Kirby Bracket to accommodate several situations that otherwise make it difficult to install Post Face Brackets. See Kirby Modifications. Dimensions list horizontal measurement first. Normally used in 1-1/2" thickness and unframed. We do not recommend 3/4" thickness for Brackets longer than 26" due to possible warping. Optional frame adds approximately 2" to both horizontal and vertical dimensions. Drawings not to scale. Lg - 6-3/4" x 20"
Lg - 7-1/2" x 20"
Lg - 7-1/2" x 24"
Lg - 7-1/2" x 17"
Lg - 7" x 17"
Lg - 6-1/2" x 26-1/4"
As shown below, we can slightly modify the Dickson to permit horizontal installation. Lg - 7-1/2" x 18"
As shown below, we can slightly modify the Haley to permit horizontal installation. For the 4 designs directly above, Finial is made of light-colored smooth hardwoods, regardless which Bracket material is selected. 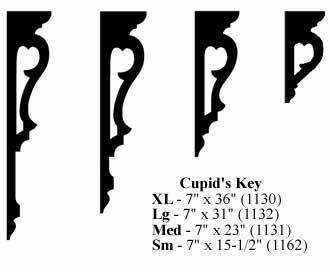 Brackets 1-1/2" and 1-1/4" thick include Finial #182015. Brackets 1" and 3/4" thick include Finial #182010. Although not shown above, our 3" thick Citrus Top Corbel makes a fine Post Face Bracket. Material and Cutwork Thickness: Select one - last selection is ''Other''----------------------------------------------Poplar, 3/4''Poplar, 1'' Poplar, 1-1/4'' Poplar, 1-1/2'' --------------------Cypress, 3/4'' Cypress, 1'' Cypress, 1-1/4'' Cypress, 1-1/2'' --------------------PVC, 3/4'' PVC, 1'' PVC, 1-1/4'' (Not available in 1-1/2'' PVC)--------------------Pine, 3/4''Pine, 1'' Pine, 1-1/4'' Pine, 1-1/2'' --------------------Oak, Red, 3/4'' Oak, Red, 1'' Oak, Red, 1-1/4'' Oak, Red, 1-1/2'' --------------------Oak, White, 3/4'' Oak, White, 1'' Oak, White, 1-1/4'' Oak, White, 1-1/2'' --------------------(Not available in 3/4'' Cedar)Cedar, 1'' Cedar, 1-1/4'' Cedar, 1-1/2'' --------------------Redwood, 3/4'' Redwood, 1'' Redwood, 1-1/4'' Redwood, 1-1/2'' --------------------Other - I'll contact you about another wood and/or thickness.Other - Contact me about another wood and/or thickness. Sale Item? (see Sale Listings): Select one--------------YES, it is on Sale List.NO, it is NOT on Sale List.